One of the major causes of pain in pets is arthritis. Arthritis is characterized by pain and inflammation in the joints that can make it difficult for pets to get around. If a dog or cat is overweight, this places even more stress on the joints and causes more discomfort. Putting your dog or cat on a diet that keeps them at a healthy weight might be the best thing for them. Even if your pet doesn’t have arthritis, being overweight can contribute to other disease processes and pain. Should you reach for a hot pack or a cold pack if your pet is in pain? Well, that depends on the nature of the pain! In the event of an acute injury, something that happens suddenly, or for surgery recovery, use an ice pack to reduce pain and inflammation. Apply for about 20 minutes at a time and check a few times to make sure the skin looks ok and the ice pack isn’t too cold. If you’re talking about ongoing chronic pain, a hot pack may help to increase comfort and function. There is a growing body of evidence for the benefits of acupuncture in treating pain. There have been times a pet limps in for an acupuncture appointment and walks out after the session. It can be pretty incredible. Dr. Amy Hinze studied Traditional Chinese Veterinary Medicine at the Chi Institute and performs acupuncture treatments on patients at Winslow Animal Hospital. Stress, fear, and anxiety lead to an increased sensitivity to pain. 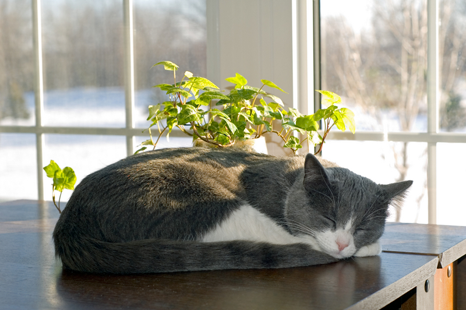 We need to do what we can to keep our dogs and cats relaxed and comfortable. Handle your pet gently, spend time with them, and maybe leave an article of your clothing with your scent on it for your pet. The smell will be comforting, and leaving an old t-shirt is a lot better than coming home to your favorite pair of shoes being torn up. 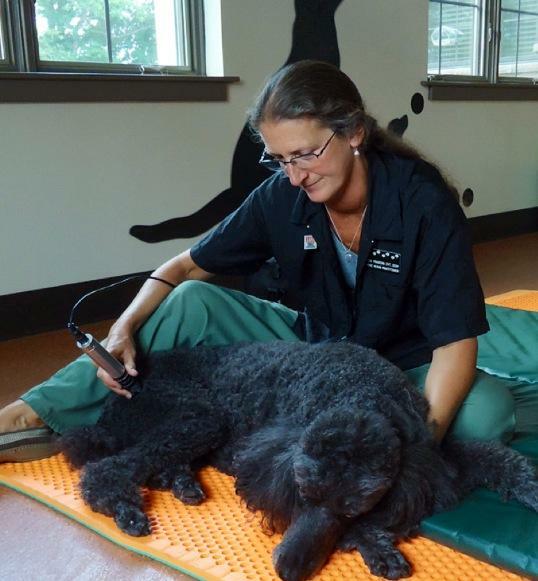 There are a bunch of different ways in which a Certified Canine Rehabilitation Practitioner like Linda Franzini can help to reduce your pet’s pain. Aquatic treadmill therapy, massage, cold laser therapy, joint manipulation, and other methods can help your pet recover from surgery or manage a chronic condition and improve quality of life. I did not know that leaving clothes with your scent could comfort your pet and help reduce stress. It makes sense since we use certain scents to make us feel relaxed. I’ve heard that some pet owners will also record their voice to be played while they are gone, does this actually help? That has been said. It probably depends on the pet, but it makes sense that it might help the pet not feel so alone to have their owner’s voice playing in another room. You could try it and let us know how it goes! This is some really good information about helping a pet manage pain. My family dog is pretty old and he is having some issues. So, I liked that you pointed out that acupuncture can help him out. I wonder if him getting surgery could help him out.